More than 33,000 people have been evacuated from villages near one of Guatemala's biggest tourist attractions after a volcano erupted, spewing clouds of ash two miles into the sky. Authorities said although they expected the eruption to last at least 12 hours the colonial city of Antigua, which sits six miles north east of the volcano and is home to 45,000 people, was not currently in danger. 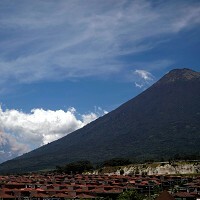 Following the powerful eruption of the long-smouldering Volcan de Fuego, evacuation orders were issued to 17 villages in the surrounding area. As the clouds blew south-south east from the volcano vehicles covered in volcanic ash were seen speeding down the two-lane highway towards Guatemala City, carrying the thousands of people fleeing the area. Many of them crowded into the back of trucks. The eruption will likely have seen holidaymakers taking a closer look at their travel insurance policies. In the sugarcane fields surrounding the volcano the clouds of ash reduced visibility to less than three metres as local people filled old school buses and ambulances carrying them from the area. Nearby in the town of Santa Lucia, people, mainly women and children, started arriving at a school that is being being used as a shelter by the authorities.